What do the Wallabies, Roger Federer and Richard Branson have in common? They all do their jobs with a game plan. Business planning are not dirty words because it is difficult to succeed in business without plans, strategies, risk analysis and a detailed understanding of your opponents, as well as, of the industry and environment your business operates in. 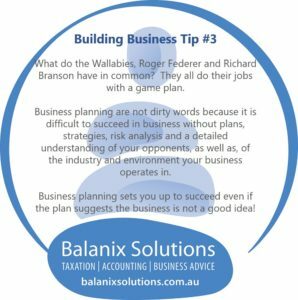 Business planning sets you up to succeed even if the plan suggests the business is not a good idea!